It's the biggest indoor tennis tournament in the world and already qualified for this year's Nitto ATP Finals are World No. 1 Rafael Nadal of Spain, Serbia’s five-time champ Novak Djokovic and six-times winner Roger Federer of Switzerland. The event takes place at The O2 in London from 11-18 November and, courtesy of our tennis ball partner HEAD, we have a pair of tickets to give away for the afternoon session (12 noon start) on Sunday 11th November. 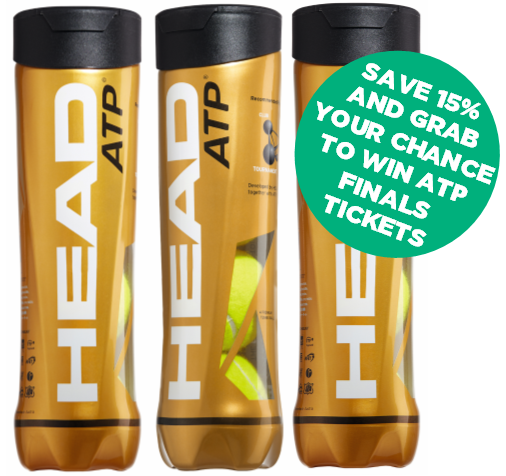 Anyone who purchases three cans of HEAD ATP tennis balls from our shop between now and Wednesday 31st October 2018 will be automatically entered in to the draw (see full Terms and Conditions here). As an extra bonus, we are offering you a special 15% discount off the usual price, which means three cans of these top-of-the-range tennis balls will delivered to your door for just £14.88 instead of £17.49!